The latest report from the Federal Reserve Board of Governors on credit utilization showed that Americans’ borrowing activity expanded at a slower pace in December (lagged release). 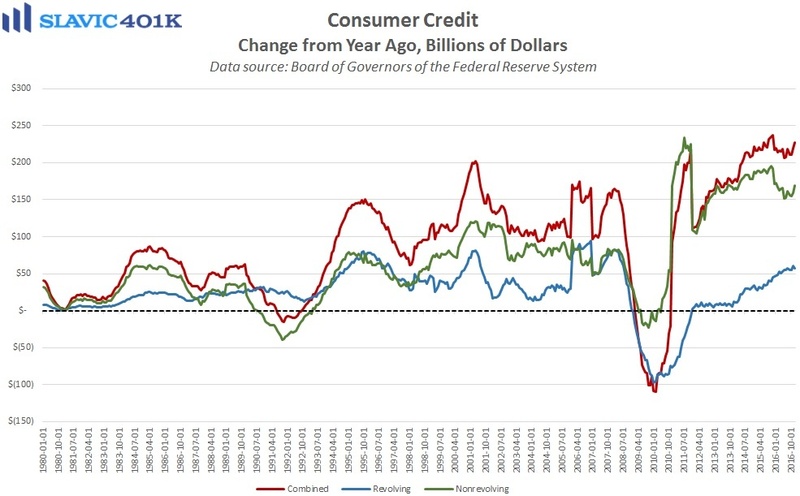 Specifically, total U.S. consumer credit outstanding rose by $14.2 billion at a seasonally adjusted annual rate of 4.5 percent during the last month of 2016. That was down considerably from November’s upward-revised $25.2 billion gain, and much smaller than the $20.0 billion increase economists had expected. Revolving credit, a metric of Americans’ credit card use, expanded by just $2.4 billion in December, while non-revolving credit, e.g. student and automobile loans, lifted by $11.8 billion, the 64th month-over-month increase in a row. Despite the post-election spike in consumer sentiment, the latest credit data suggest that many Americans were less eager (or able) to borrow in the fourth quarter of 2016. 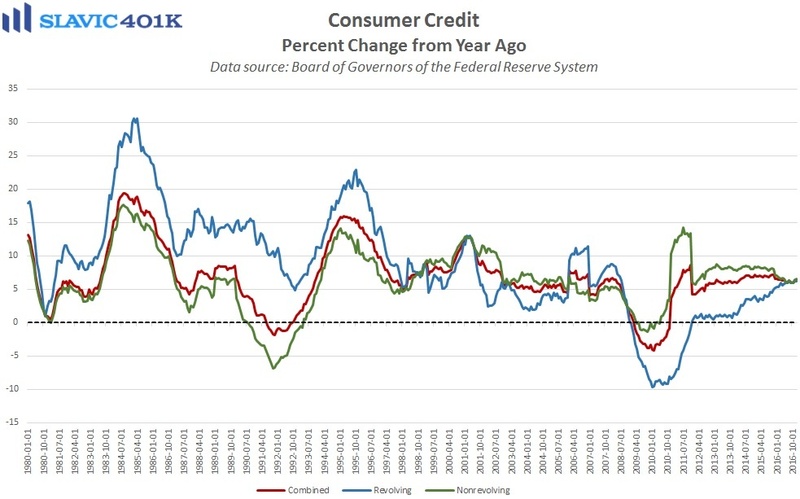 The recent uptick in interest rates following the election likely weighed on credit demand even though historically it is still very cheap for consumers to borrow. Another report from the Federal Reserve released this week showed evidence of stricter lending standards, including an “8.3 percent net tightening in credit standards for credit cards and 11.6 percent net tightening for auto loans.” Although tighter lending standards present another potential headwind for consumer credit, a strengthening labor market and accelerating wage growth can together enable borrowing demand to continue to improve.